Homes in Canada can be pricey, especially in popular urban areas. As a result, many homeowners cannot afford their mortgage payments and, eventually, their homes are foreclosed. People may also go through a foreclosure due to criminal activity, bad living conditions, and other such situations that cause them to be removed from the property. Whatever the cause of the foreclosure, the lenders who retain the liens to those properties need to do something with them to recuperate at least part of the loss they’ve taken. As such, those same foreclosed homes may be put up for sale again. Looking for an alternative to foreclosure? Take a look at this. In Canada, foreclosures are actually rarer than you might think. Some lenders, such as banks, may bring up the idea of foreclosure to get borrowers to make timely payments. More often than not, lenders don’t want to go through the foreclosure process. In fact, it’s expensive and time-consuming, as they often need to go through legal proceedings, as well as selling the home at auction or putting it up for sale at a lower price than it was originally, resulting in a loss of profit. Check out these other secrets banks don’t want you to know. That being said, it’s best not to get overly confident with that notion, because foreclosures do happen under extreme circumstances. Generally, lenders will revoke the home’s title once 4 mortgage payments (about 120 days) have defaulted, although the process may vary from province to province and lender to lender. Once the foreclosure is finalized, borrowers will usually have 30-35 days to vacate the premises. Frequently seen in British Columbia, Quebec, Alberta, Saskatchewan, and Nova Scotia, this is when the lender needs to petition to the judicial court for permission to sell the home. This process takes much more time and money because of the lengthy court case and legal fees involved. If they wish, lenders in these provinces can begin the foreclosure process immediately after the first mortgage payment is defaulted (however unlikely that may be). Soon after, a legal proceeding will begin, wherein the borrower will be served with a “Statement of Claim for Debt and Possession” and will be given 20 days to file a “Statement of Defence” in response. If the borrower loses their case or doesn’t file a Statement of Defence at all, the lender will be granted permission to sell the home. The whole judicial foreclosure process can take several months to a year. Once the process is over, the lender can sell the property with the help of a real estate agent or through a real estate auction. A large portion of the return they see from reselling the property will then be used to cover their legal fees. Common in Newfoundland, Ontario, P.E.I. and New Brunswick, a Power of Sale is when the lender, through a clause in a homebuyer’s mortgage contract, has the right to sell the property and avoid the judicial court procedure. Typically, after 4 missed payments, the process will begin. The borrower is given a 35-day redemption period, during which they’ll have the opportunity catch up on their defaulted payments, as well as any outstanding tax arrears, late penalties, and fees associated with the Power of Sale itself. If, however, the borrower fails to make these payments, they’ll again be served with an eviction notice and will need to vacate the premises within 30 days. Once again, the lender is likely to sell the property through a traditional real estate sale or at auction. However, they’ll need to sell it at the highest price possible as a way to cover the balance remaining on the unpaid mortgage. Check out this infographic to learn about the cost of buying a house in Canada. As we mentioned, foreclosures and sales of foreclosed homes are rare in Canada and are more common in the United States. That said, it does happen and there are ways that you can buy a foreclosed property, which involves a different procedure than a traditional mortgage. However, before you start looking into buying a foreclosed home, it’s important to understand the inherent benefits and risks involved. The lender, eager to recuperate their loss, will want to sell the property quickly. They may even sell it at a lower price than it was initially. If you buy the house at auction, it’s sometimes possible to get an even lower price. Any liens, backdated taxes, or outstanding mortgage payments remaining on the property will be expunged, as these factors would make it harder for the lender to resell the home. This option can be beneficial if you’re a landlord with plans to buy and fix up cheaper properties and then rent them out. If the property goes for a cheaper price, you can use the money you’ve saved for maintenance purposes or to making home improvements, thereby increasing its value and your home equity in the process. You may even be able to sell the property at a profit some day. While foreclosed properties can be cheaper, they are not rock-bottom prices, as you might have heard. More often than not, you would acquire the home at only a slightly cheaper price than it was initially. The real estate market in Canada is very competitive. If the location of the property is desirable, it’s likely to be snatched up quickly by another buyer. If not, the price of the home may not be cheaper at all, it may even end up being higher. The legal and financial procedures for buying a foreclosed home are more strict and complicated than the average home sale. Foreclosed homes are usually sold in a “what you see, is what you get” state, meaning you’ll have to cover all repairs or renovations by yourself. You’ll also have to get rid of any possessions that may have been left behind. The terms of the mortgage contact may absolve the lender from any of these responsibilities, as well as any future liability for the property. If there are foundation, hydroelectricity, or zoning problems, they are your responsibility. No warranties will be offered. Visiting hours (before you buy the home) are more restrictive. If the property is damaged or the hydroelectricity has been shut down, you may only be able to view the home during certain hours and when accompanied by a realtor. Here’s what you should know about land transfer taxes in Ontario. Comparing lenders in Canada? Read this. Sure, the home itself might be listed at a lower price. Then again, who knows what’s really wrong with it? Make sure to seek the counsel of both a financial and real estate professional advisor to be certain that buying a foreclosed home is the best choice for you. Ask them about all the potential costs and risks involved. Do the benefits of buying a foreclosed home outweigh those of a normal one? If not, it might be better to avoid the purchase altogether. Since buying a foreclosed home is more complex, having a professional realtor will be more necessary than ever. Not only can they help you find the right property, but they’ll also facilitate and guide you through the whole process. There are a lot of different steps you’ll need to go through, including an inspection and a court date. Fortunately, many lenders, such as banks, will provide a realtor at no cost to yourself. Need to know how to enter the Canadian housing market today? Then click here. One of the easiest ways to make sure you’re getting a good deal is by having the property inspected and appraised for its value. While your lender might provide a similar inspection and appraisal, it might be better to pay for your own, just to confirm that you’re not buying a property that will never reach its full potential. Additional damages that may have occurred between when you last viewed it and when you actually took possession of it. 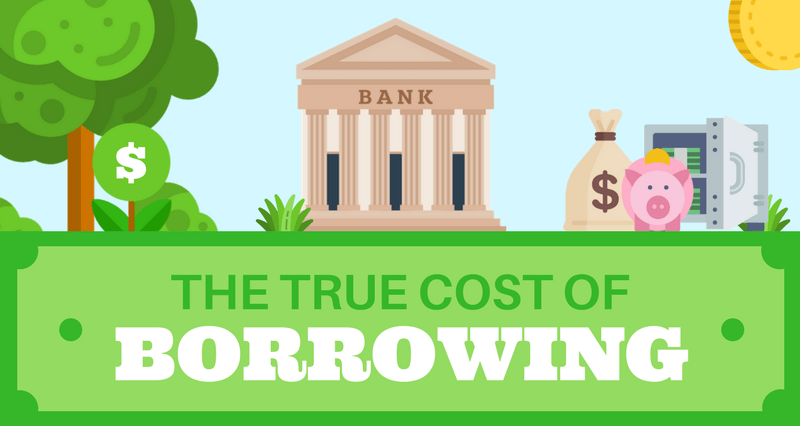 Check out this infographic all about the true cost of borrowing. To see some more tips that are helpful when applying for a loan, read this. Even if the foreclosed home sells for a relatively low asking price, it’s still likely to cost a pretty penny. Therefore, it’s essential to save the most money as possible, so that you’re able to comfortably afford your future mortgage payments, as well as your other regular expenses. One way you can do that is by securing an affordable interest rate for those payments, which you can accomplish by having your credit in good shape before you apply for financing. Want to know how a foreclosure would affect your credit? Find out here. In Canada, credit scores range from 300 to 900. A score of 680 or higher is a sign of good credit. Your lender will consider you more creditworthy for it and will offer you the best approval chances and interest rates for it. While you can, of course, still secure financing with a lower score, your interest rate will be higher the lower your score is. So, by raising your score and improving the look of your credit report as much as you can, you’ll be effectively saving yourself money over the course of your new mortgage. From then on, as long as you make your mortgage payments on time and in full, you’ll be strengthening your credit and putting yourself in range of better approval odds and interest rates for any credit products you apply for down the line. Trying to buy a house in Canada with bad credit? Check this out. Looking for financing so that you can purchase a foreclosure property? We can help you with that and much more! Contact Loans Canada today and we’ll put you in touch with the best source for home financing in your area.